There are several ways to accomplish this. Let's start with the basic ones. This is one way. You can even change the size of the splitted pieces. Just change the part that says --bytes=1M to --bytes=1K for 1 kilobyte or 1G for giga, or another number like --bytes=4K for 4KB pieces. Another way is the compress option in the gui of Nautilus. It gives you an option to split the file or files you want to compress into smaller megabyte sizes. Its simple and easy. This will create 5MB size files from the ubuntu.iso. The -v5m is the volume size so you can change it to 10, 12, 1, 3 and also the m can be changed to k for kilobytes, etc; the -mx0 switch tells 7-Zip to use no compression, that is, just to split data into parts. which has the same effect here. Using split -b with the appropriate number, you can get three pieces. cat "file name"* > "file name"
Manual pages will help fill the details. Is a popular freeware program to split and recombine files. The program is available on Windows, Linux and a variety of other platforms. 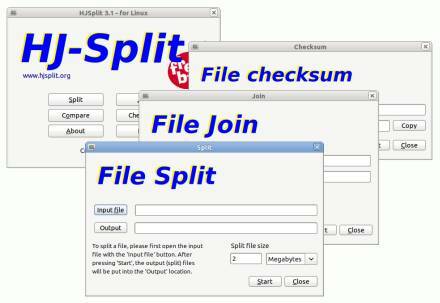 HJSplit for Linux is a freeware file splitter for Linux with full graphical user-interface. HJSplit supports file sizes of over 100 Gigabytes, Split, Join/Recombine, MD5 checksums, file-compare, "run without install" and the program is fully portable. GNOME Split is a tool that allows you to split files and merge them back. 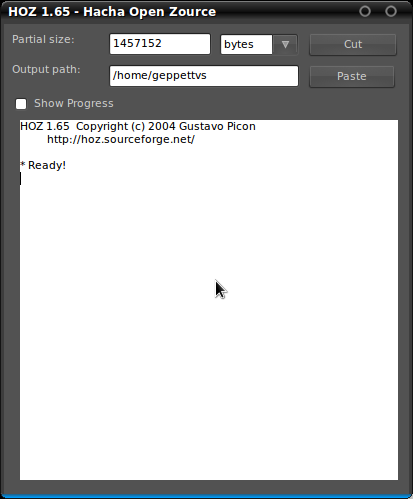 It is written in Java and uses a GTK+ user interface (thanks to the java-gnome project). The goal is to offer a native implementation of similar projects which can handle multiple file formats (e.g. Xtremsplit). OZ is what you would call a 'file splitter'. Its file format is the same as the one used by the 'Hacha' software, a well known splitter in Spain and Latinamerica. HOZ is an open-source and portable C implementation of an 'Hacha' compatible splitter. HOZ is smaller and faster than 'Hacha'. After installing, you can use the Hoz GUI by dropping ghoz in a terminal. The operation is so simple that needs no explanation but further information can be reached in the developer's site. A free file split and merge utility developed in Java. It is a small size application that allows a user to split any type of file in smaller sizes in KB, MB or GB. It is available for Linux as well as Windows. WoodCutter offers 3 ways of merging back the original files. WoodCutter creates a merge file which can be processed by the WoodCutter application to join all the files back. In case the receiver of split files does not have WoodCutter installed, then also the original file can be obtained as WoodCutter also creates a batch file and a Shell script file to merge the files back. The batch file will be used in Windows platform and Shell script will be used in Linux platforms. Not the answer you're looking for? Browse other questions tagged files join split or ask your own question. How to split a file up into many smaller files and then reconstruct them?